Availability and efficient operation of local treatment facilities is a binding legal requirement set to industrial entities. Waste water treatment permits not merely minimizing ecological environmental impact but saving significant tangible assets thanks to the use of treated water for process needs. State-of-the-art industrial water treatment and conditioning technologies provide combined solutions to waste water treatment challenges at any enterprise. Depending on the process chain selected efficient treatment based on one and more than one parameters is possible. In the course of technological development hardware has undergone major changes. It has become more compact, more efficient and less dependent on external conditions. The process procedure is fully automated minimizing in practice human participation in it. STATE-OF-THE-ART INDUSTRIAL WATER CONDITIONING SYSTEMS. Due to their specifics various manufacturing entities set special requirements to the quality of water consumed. Waste waters generated at the end of the process chain shall significantly differ in contaminant composition and quantity. In order to solve problems connected with water consumption and disposal in each industry sector a package of standard procedures has been developed; this package takes the majority of possible situations into consideration. However, there are some exceptions for which tailored specific process procedures shall be developed. 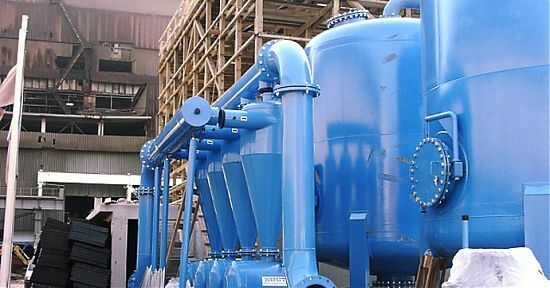 TYPES OF WATER TREATMENT AND CONDITIONING SYSTEMS. • monitoring, indication and automatic flow control systems. Irrespective of complexity and reliability of the systems it is always required to consider the necessity for maintenance and preventive works. These works help to improve performance efficiency of the equipment, avoid unforeseen events and volley of sewage or prevent supply of water of poor quality to the production process.